We went looking for the best books to read this year and a wonderful thing happened: we discovered they were all written by remarkably talented women. 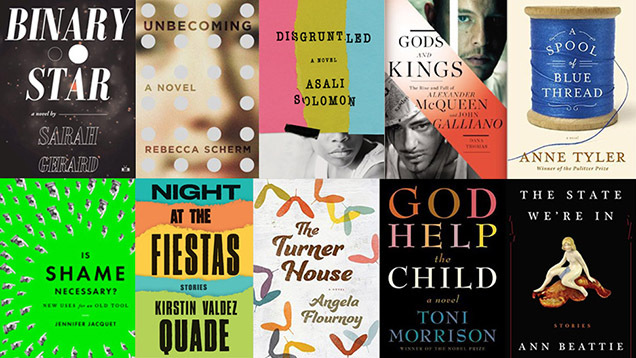 A particular chorus of men will publish some decent books, but women, by far, will own 2015. Below, 10 books to fall in love with before year’s end. We deferred to Jezebel Features Editor, and friend of Gawker Review of Books, Jia Tolentino on this one, who devoured her advance copy in one, unforgettable sitting. “Cutting, thrilling, miraculous,” she said of Scherm’s first book. So, yeah: order Unbecoming now. Here is author and anthropologist Zora Neale Hurston in 1942: “I have been in Sorrow’s kitchen and licked out all the pots. Then I have stood on the peaky mountain wrapped in rainbows, with a harp and sword in my hands.” Follow Kenya Curtis from “Sorrow’s kitchen” to “the peaky mountains wrapped in rainbows” in Asali Solomon’s brave, bracing, and undeniably extraordinary debut novel, Disgruntled. Alexander McQueen died at the age of 40. He was a titan of fashion who, perhaps, still had his best work ahead of him. In Gods and Kings, Paris-based journalist Dana Thomas unspools the intertwined lives of McQueen and design contemporary John Galliano with the eye and precision of a historian. It is one of the year’s most inspiring works of nonfiction. Since the printing of her first work, If Morning Ever Comes, in 1964, Anne Tyler has published at an unflinching pace: 19 novels in 50 years (one of which awarded her the Pulitzer Prize). Tyler’s newest work, A Spool of Blue Thread, is a generational family saga with the Baltimore-dwelling Whitshanks at its center. This is a book about love and the tensions that bind us; it is signature Tyler: focused, wholly audacious, and damn good. It’s no secret: we’re a celebrity-obsessed, media-driven culture, and shame—or more precisely, the act of shaming others or of feeling ashamed—is part of our DNA. But what if we could use shame as a tool for good? New York University Environmental Studies Professor Jennifer Jacquet certainly thinks we can. Her new book mines the possibilities of shame to be used as an agent for positive change. Where the book lands is as unexpected as it is revelatory. We’ve been anticipating Kirstin Valdez Quade’s debut work since the 2009 publication of “The Five Wounds” in The New Yorker. And it’s finally here. Night at the Fiestas, a short-story collection, chronicles the lives of New Mexico’s wayward souls—a desolate retiree, a distant father, a whimsical young girl, a dispirited priest—as each seeks out personal deliverance. Quade renders her characters with the fullness of humanity: men and women, though sometimes derailed, full of love, longing, and light. You can’t ever truly escape family. That’s the message that echoes throughout Angela Flournoy’s searing debut, The Turner House. Detroit is not the city it was 50 years ago when Viola and Francis Turner rooted their thirteen children on Yarrow Street, where almost every child was seduced by “the comfort of the big room’s walls.” But now, with Francis passed away and the city’s heart on life support, Viola must move on. Her decision to move in with her eldest son draws each child back to the house, one last time, to confront the past. The Turner House is an unforgettably vibrant story about determination and the sacrifices we make for family. Look, Toni Morrison doesn’t need our praise. Senior Editor Jason Parham already predicted this to be 2015’s singular work, and it’s likely to top most year-end lists. That’s just what Toni Morrison does: she writes haunting epics about fractured, dream-filled communities populated with women who have “stunning blue-black skin” and men with dark-seeded secrets. God Help the Child will not disappoint. We promise. Ann Beattie is a virtuoso of form and economy, and her collected short stories—from 1976’s Distortions to 2005’s Follies— have endured for decades. She’s covered it all: failed marriages, dubious baby boomers, eccentric women, and emotionally fraught families. Beattie’s newest collection, The State We’re In, threads the lives of women traversing an ever-changing Northeast milieu. With four O. Henry prizes under her belt, this collection poses to reassert Beattie as a master of the short story.